Police arrested a 57-year-old man early Sunday morning for prowling after several tips came in with video evidence from home security cameras. 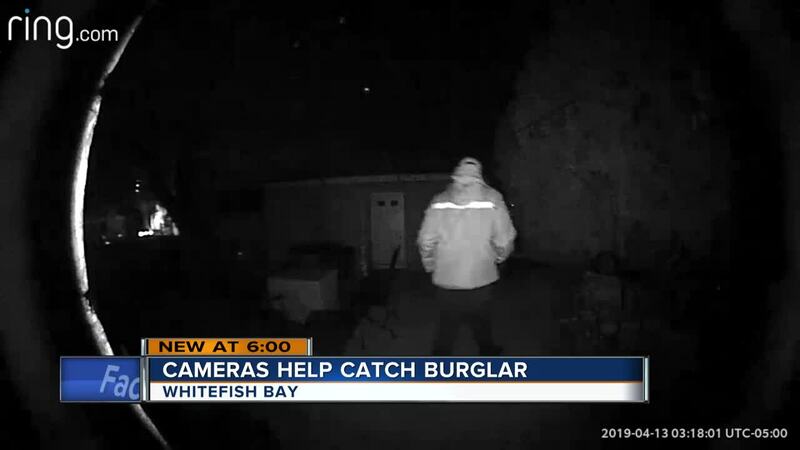 Whitefish Bay Police say the man has been doing this for nearly 30 years in the area, breaking into homes and cars. However, things are much different now in 2019 than they were when he did it in the 1990s. "It's totally kind of revolutionized how we respond to these things," Lt. Patrick Whitaker of the Whitefish Bay Police Department said. "People calling us right away or emailing us video clips they're able to download and send them to us." Doorbell cameras and other home surveillance equipment has become much more attainable in recent years. Products such as Ring or Nest have become more popular with some costing less than $100. They are even more crucial to helping land crooks. "In the past, this person might not have ever known someone came to their door in the middle of the night," Whitaker said. "Now they're alerted right away that someone's there. There's video evidence they were there, and we're able to link them to the crime." Whitaker says within minutes police were able to locate the man just a few blocks away from where he was seen on the surveillance camera. "Without that happening, we probably never would have known he was there," Whitaker said. While Ring and Nest are just two options for surveillance cameras, there are many others for consumers. "There's almost too many to count at this point," Andrew Hudson of Best Buy said. Hudson says the prices can vary from less than $100 to more than $800 in some cases. He says they have people available to install the cameras, should people need help. However, he says most come with step-by-step instructions to make it even easier. "There's a security system for just about anybody," Hudson said. "The technology has evolved. With that evolution, the prices dropped on some of the ones made a couple generations back. That doesn't mean the quality is bad. It just means there's newer technology that's more expensive, and now you can get the ones a little cheaper and still do a really good job." The man in Whitefish Bay was arrested for prowling and will likely face jail time for violating parole.